Living with our parents for eighteen years or more, we’re bound to take on some of their characteristics and qualities during that impressionable time, whether good or bad, and whether we’d like to admit it or not. For the past decade, I have been working on undoing many of those that I deem unacceptable, such as being overly critical and dramatic, and have been moderately successful. One of the many bad habits that I haven’t been able to completely shake is the tendency to buy things that I really don’t need, simply because they are on sale. Yes, I was raised by a woman who can’t resist a sale. I believe this may be a common thing among women(? ), but perhaps not to the degree that my mother takes it. My parents (now empty-nesters) have three refrigerators and two freezers, and Mom has stocked enough canned & frozen foods (purchased on sale, of course) to last them at least six months without making a trip to the grocery store. Ironically, she does the same thing with produce, of which at least half goes bad before they can eat it so she ends up wasting money rather than saving it, at least in that area. I often see an entire crisper drawer full of avocados, tomatoes, onions, etc, and many are still there two months later in a much sadder state. Though I have never shopped sales to this degree, I have purchased my fair share of unneccessary items simply because they were a good price. A butter pecan cake mix, for example. Not an item I needed or was very interested in, but it was on sale so I had to have it. For two months, I glanced guiltily over at that mix each time I opened my cupboard where I keep most of my baking supplies. I finally, finally took the cake mix down and found a recipe on the back for butter pecan-rum cake…and that’s all she wrote. I made it immediately and after Dennis and I ate 1/3 of the cake ourselves, I brought the remainder to work where it was promptly devoured. 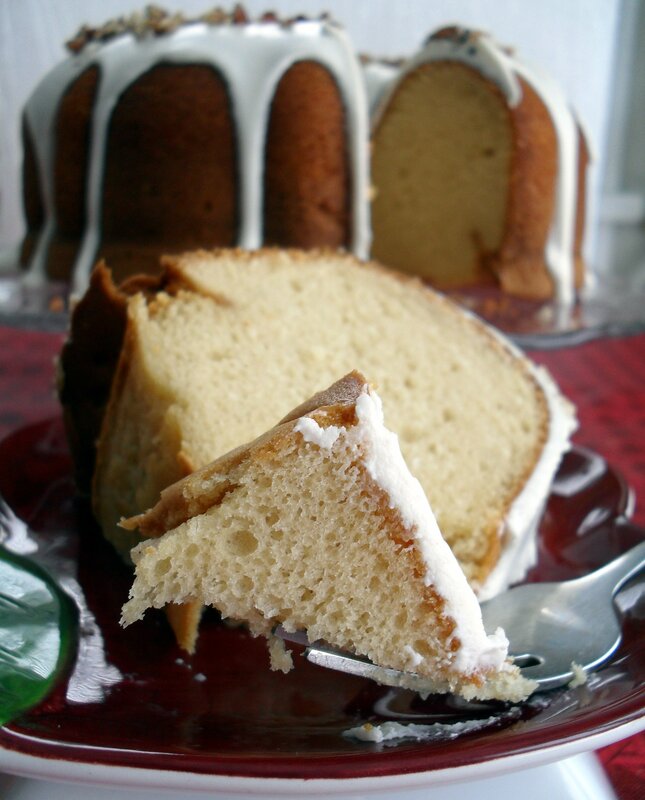 The butter & sour cream really make the cake super-moist–even the next day after storing it with a big hunk missing. And the addition of rum is just perfection with the butter pecan flavor. The moral of the story? Next time your husband complains that “you’re just like your mother,” make him this cake to show him that’s not always such a bad thing. 1. Heat oven to 325 degrees. 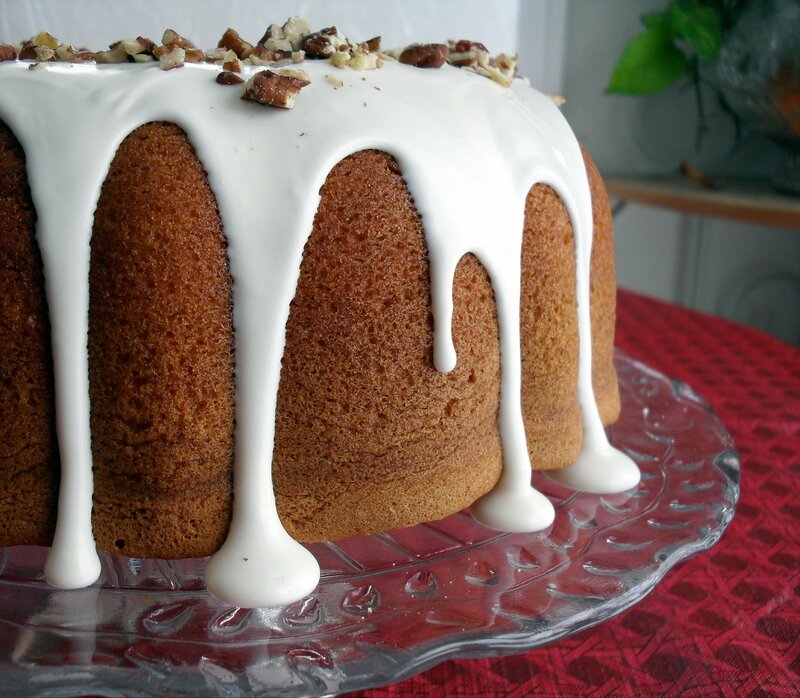 Grease and flour 12-cup fluted tube (bundt cake) pan. In large bowl, beat dry cake mix, dry pudding mix, water, sour cream, butter, 1/4 cup rum and the eggs on low speed 30 seconds. Beat on medium speed 2 minutes (it will turn into liquid velvet!!!). Spread in pan. 3. In small microwavable bowl, microwave frosting uncovered on Medium (50%) 15 seconds. Stir in 2 teaspoons rum. Pour over top of cake, allowing some to drizzle down sides. 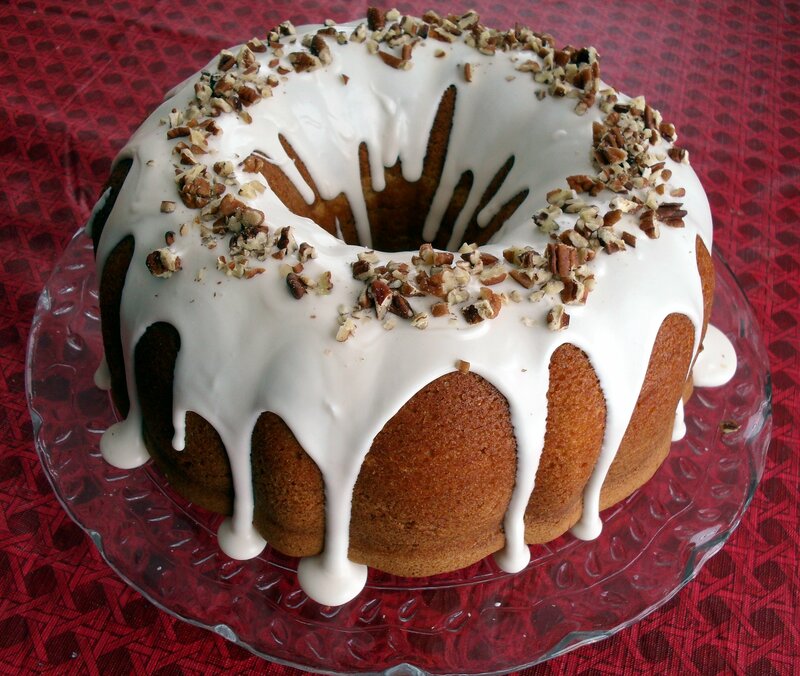 Sprinkle pecans over frosting. Store loosely covered. High altitude (3500-6500 ft): Bake 52-58 min. Posted in Cake & Frosting and tagged butter pecan, cake, rum. Bookmark the permalink. Thank God for your post!!! I wanted to make this recipe again, and always counted on it to be on the darn box…WRONG!! Then I went for my “saved” copy…WRONG again (a kitchen remodel will scatter things!! )… Finally, I started searching the web and there your link was!!!! Thank you, thank you, thank you!!!! LOL–been there! So glad I could help.